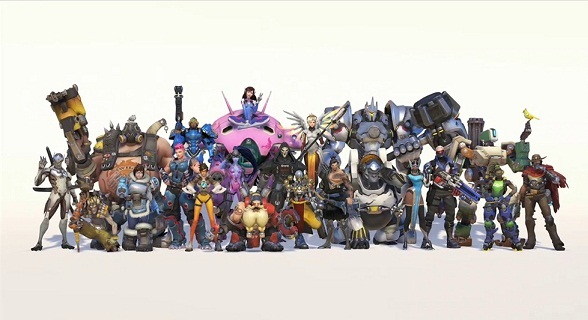 In Blizzard's competitive shooter Overwatch, there are 21 heroes to choose from and they are divided into four classes. With them you can form a balance team. Have you already tried a few characters, but unable to find the one that suits you, then this guide might help you to pick the right heroes for you. Each character has unique abilities, equipment and ultimate skill. Thus, each hero plays differently, so you can select the character to your play style. We show you below which heroes are best suited for beginners. Soldier: 76 is a classic character in first-person shooters. Therefore, you should not neglect him. He is not only fast, but also achieves a high damage with his pulse rifle and his Helix missiles. Crash you with him to the enemies, if they remain in a favorite position. So you can get them away from places. Bastion is a robot that has three different configurations. With the ability to reconfigure you can select a different setting. So he varies between a heavy tank, a mobile reconnaissance or a steady attack, depending on how the situation looks like on the battlefield. Select beginning his gun configuration and watch as the enemies are destroyed, before they know which way the attack comes. Reinhardt has not only a high-end equipment, but also a missile Hammer. With this weapon he can perform all sorts of strong attacks. With the attack Quake he rammed the hammer into the ground and causing a nasty shock wave that inflicts high damage to enemies. No one wants to get too close, because he not only has high health, but also can really dish out much damage. His barrier field builds up a protective shield that absorbs a lot of damage. The only downside: He can run in time an attack. Located in the team but still Bastion, he can aim behind the sign with his gun at enemies. Mercy is a beautiful angel from Switzerland. She increases the attack damage of a team member or can resurrect nearby friends after death. She will not fight in frontline, but rather take a helping role, you learn with Mercy easily know the Supporter class. The ability guardian angel she can aim at allies and quickly fly to them, to support them at the decisive moment. Pharah comes from Egypt and she is armed with a heavy battle suit and a rocket launcher. The ability barrage can bomblets rain down on groups of enemies. With whiz she shoots thanks to her thrusters into the air quickly. Thus she can look out for other enemies or reach points on the Map, to which one does not reach so quickly. With Pharah you can pursue new paths, rather than using predetermined directions. This confuses the opposing team. Roadhog describes himself as a "one-man Apocalypse" - and yes, it's true. With his ability to tow hook can begging for mercy your enemies. Target of an enemy uses to attack and pull the opponent closer to you, and then to bring a load of buckshot. With breather he rests briefly and improves his health slightly. However, the only disadvantage of this tank is his character. Opponents easily discover him because he comes powerfully on the battlefield.